Two years ago, I read a New Yorker review about this book–it was brief but it intrigued me. Then, there was this article about Meg Wolitzer’s influences as she was writing it. I’ve since kept an eye out for it and snatched up a copy at the Schlow Library booksale (an on-going sale at my local library–keep an eye out at your library for these types of sales–great spot to pick up books to give away and the money supports the library). Basically, The Interestings follows a group of friends who meet at the Spirit-in-the-Woods summer camp for art in the 1970s and then moves with them through the next forty years. The cast: Jules, the witty actress who never quite feels like she belongs with this group; sweet, beautiful Ash and her imposing, charismatic brother Goodman, who come from privilege; odd Ethan Figman, who draws/animates and smooths over conflict; Jonah, a musician whose mother is a famous folksinger; and beautiful Cathy, a dancer. What I liked most about this book was how it followed these characters as they grew and changed, loved and lost. In some ways, it reminded me of a Jonathan Franzen book (only less sexist)–epic, sweeping, carrying you through the zeitgeist of each generation. I found myself really relating to the characters even as their flaws were exposed. It also explored the crisis of becoming and adult and how to be artistic or talented or creative as an adult. The different ways in which characters were able to incorporate their teenage creativity into the adult world raised some interesting questions for me. Is it foolish to think we can carry our mediocre creative talents into adulthood? What if you are really talented? Is it then your obligation to use that talent in your job? How can art sooth us as children and adults. 1. Literary jokes with your students. Just this week, students were out shopping and posted an image of them with a hat and the hashtag: #tobuyornottobuy and I was able to reply with a #hamletfashionadvice tweet. 2. 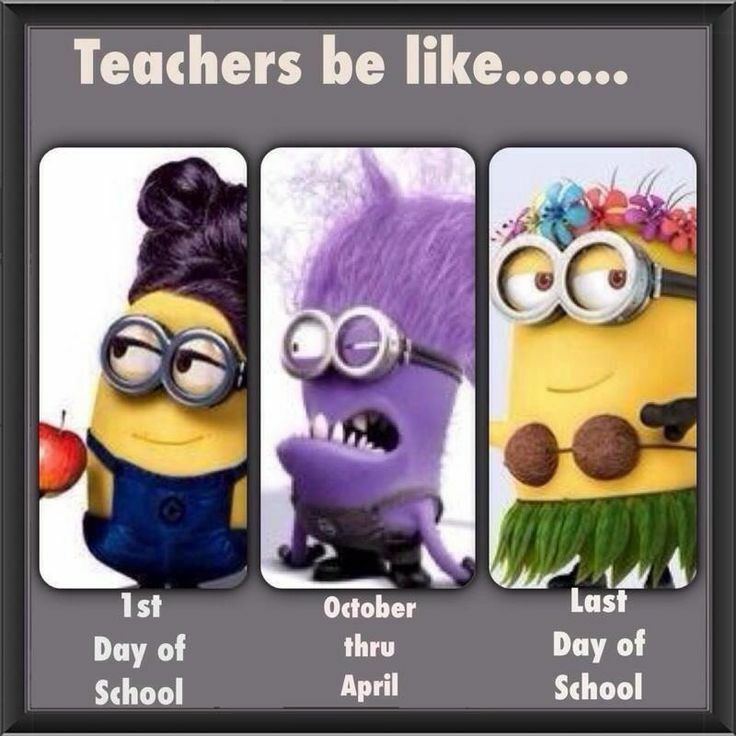 Sharing the funny things that come out of your classroom. I love tweeting out the memes, images, funny quotes, and profound insights my students have in class. It reminds me how awesome students are and how much teaching can be about discovery. (The meme below was created by a student in response to A Streetcar Named Desire). 3. Twitter provides you with a timelime of your year. This week I went back through my images so I could use them for PowerPoint Roulette with my seniors, and it was great to see all the images from earlier in the year I’d forgotten about. 4. Great PD opportunities. Although we’ve only just started #pctelatalk on the 3rd Monday of the month at 8pm, there are plenty of other professional development conversations and resources on twitter. 5. Tweeting at authors who will tweet back at you and your students! I know I’ve mentioned this before, but how cool that there are so many authors who will respond to student and teacher tweets. 6 degrees of separation has become just one degree. Need an easy way to pull together posts on different social media platforms? Try using storify. We used it recently to pull together tweets for our #pctelatalk (occurring the 3rd Monday of each month at 8pm). If you have time this summer, play around with this and see if you can incorporate it into an assignment. Our school is trying to document images of a building that will soon be demolished, and they’ve been able to compile images from Instagram, twitter, and facebook. It has allowed the community to share on a variety of platforms, which has been interesting to see. 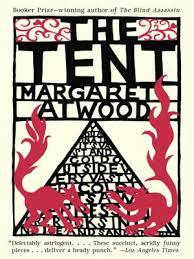 You all probably already know I’m enamored with Margaret Atwood. I think she’s one of the greatest writers of our time. I’ve reviewed Stone Mattress and Negotiating with the Dead on here already. Last year I even had the pleasure of hearing her read from Stone Mattress when she came to State College, PA. (The best part was the hockey video she showed before she came on stage. No, wait, the best part was that she cracked herself up when she was reading her own work–laughing at the same parts I found hilarious.) Anyway, last week at the book sale I found a copy of her book of short pieces, The Tent, so of course I snagged it. So if you’re interested in reading some of Atwood’s shorter pieces, this is a nice place to start–each selection ranges anywhere from one page to five pages, and it is easy to pick up and put down if you don’t have a large chunk of time. However, these little pieces are guaranteed to stay with you for a while. 2. Some seniors aren’t even talking, they’re just making basketball motions, asking via body language if classmates want to shoot some hoops. 3. They talk in numbers…how many days are left in school for them. 4. Where are you working for the summer? 5. What flavor fro-yo does the cafeteria have? AP week ends today, and seniors at my school (and probably everywhere) are done with school. As a senior teacher, I feel as if senioritis is like allergies–every year I think I’ll be immune, and every year I end up with it. This year has been difficult because of the copious field trips, various AP tests, and seniors visiting colleges. Most of them are just ready to be done. It always feels a little anti-climactic. This is why I’m really glad I end my year with a senior portfolio–a retrospective of the writing career of each student. They need to write a reflective piece about how they’ve improved as a writer and what goals they have as they move on from high school. It provides some closure and also makes them really articulate who they are as writers and define their own personal style. So, if you’re teaching seniors this year, best of luck in keeping them engaged–and hang in there, we’re almost done! 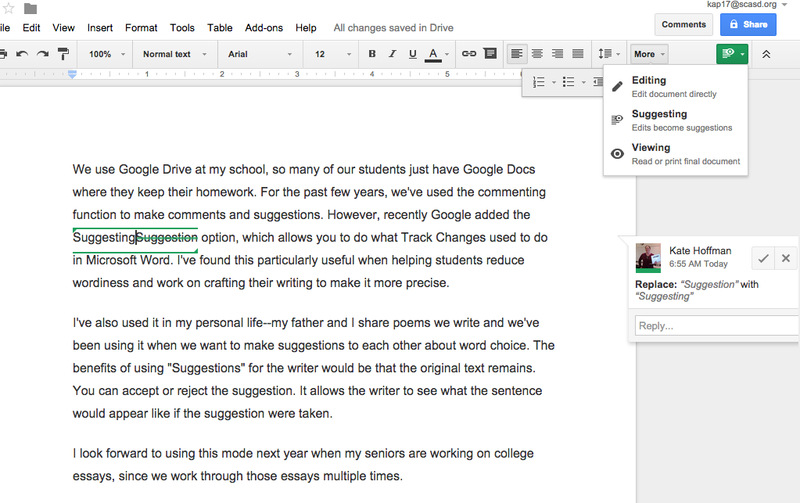 We use Google Drive at my school, so many of our students just have Google Docs where they keep their homework. For the past few years, we’ve used the commenting function to make comments and suggestions. However, recently Google added the Suggesting option, which allows you to do what Track Changes used to do in Microsoft Word. I’ve found this particularly useful when helping students reduce wordiness and work on crafting their writing to make it more precise. I’ve also used it in my personal life–my father and I share poems we write and we’ve been using it when we want to make suggestions to each other about word choice. The benefits of using “Suggestions” for the writer would be that the original text remains. You can accept or reject the suggestion. It allows the writer to see what the sentence would appear like if the suggestion were taken. I look forward to using this mode next year when my seniors are working on college essays, since we work through those essays multiple times. A student first recommended Helen Oyeyemi to me when she insisted I read Mr. Fox, which was by far, one of the most fascinating books I’d been told to read by a student. I also read White is for Witching, which I particularly enjoyed as well. I can’t quite decide if Oyeyemi writes magical realism, or fairy tales, or myths, or all of those things. I like that her work is not easily categorized. 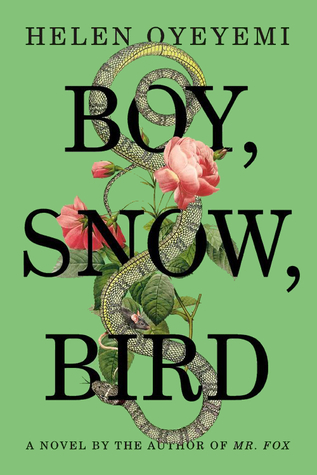 In Boy, Snow, Bird, I had no idea what the story would be about (I hadn’t read any reviews), but I immediately sunk into the narrative. It begins with Boy, who is a young girl with an abusive father who catches rats for a living. At school, she explains how her teachers didn’t trust her: “something about a girl like me writing an A-grade paper turns teachers into cops.” She is suspicious of the world and keeps to herself. At one point there’s a second person paragraph (which, oddly, works) and she writes about herself: “you don’t return people’s smiles–it’s perfectly clear to you that people can smile and still be villains.” This placing the self outside the self for examination fascinates me. It seems like Boy, Snow, Bird revolves a lot around identity. For example, there’s an interesting element of mirrors in the novel–Boy, and her daughter Bird, often don’t show up in them. Ah yes, so Boy escapes from her father, moves to a small New England town, Flax Hill, and begins life anew with Arturo Whitman, who has a young daughter, Snow. Soon, she has a daughter, Bird, and the birth reveals a secret about her husband and his family Boy was unaware of–which leads us into another element of identity and masks in the storyline. I don’t want to give too much away, but there are a number of unexpected turns and twists in the story that serve to make it deeper, more meaningful, and more fascinating as a reader. I found this to have been one of the best books I’ve read recently–the style and writing were top notch, and the story actually surprised me a few times, something I’m finding increasingly difficult to do these days. So if you’re in the mood for something a little different, try out this 2014 book by Helen Oyeyemi.